This suggests that £124 9s 10d was paid. The Earl taught himself music late in life. He purchased two other organs, perhaps kept at his London house in Lower Grosvenor Street, and had Robert Adam design a case for one of them. He was an active patron of the Handel memorial concerts and collected a large amount of manuscript music. 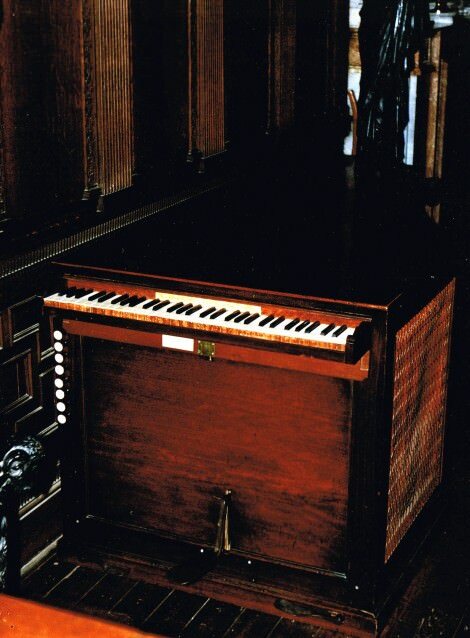 The Earl gave public concerts in the ballroom, but it seems that the organ was kept in a room in the North front (the Stone Parlour, now the North dining room), and a history of Burghley of 1797 records the townspeople of Stamford walking up to the outside of the house on Sundays for the pleasure of hearing the Earl play. There is a shifting movement pedal controlling sliders on top of those for the Fifteenth, Sesquialtera and Cornet, sprung, on the left, i.e. reducing to Diapasons, Principal and Flute. The Hautboy is in a swell box with a sliding front, controlled by a pedal on the right. The keyboard compass is C – f³ (54 notes). F – B keys were provided but never connected, perhaps to make an aesthetic balance with a fortepiano in the same room. The pitch is A428Hz at 16ºC, and the tuning a modified 1/6th comma meantone, taken from the Dulciana. The tuning seems to have remained undisturbed. Likewise the voicing and the wind pressure, which is 64 mm. There is a foot pedal at the front operating the feeder (perhaps an addition, along with the Z compensators, of Lincoln’s), as well as one with a wooden handle attached to it at the tail. The bellows are in the tail of the organ, and hence trapezoidal in plan; they may be the earliest surviving horizontal bellows in an English organ. The crimson silk (much-faded has now been replaced with an ivory-coloured slubby silk. The effect of the crimson when new, set against the mahogany when new, can be imagined.